We had a large sea swell yesterday and I was lucky enough to capture one breaking up against the breakwater. Great collage. Water is so powerful! Beautiful triptych. We had gale-force winds again a couple of days ago with big waves but I didn't go out to capture them as I have been stuck with a cold which still persists. Fabulous shots of the power of the ocean. 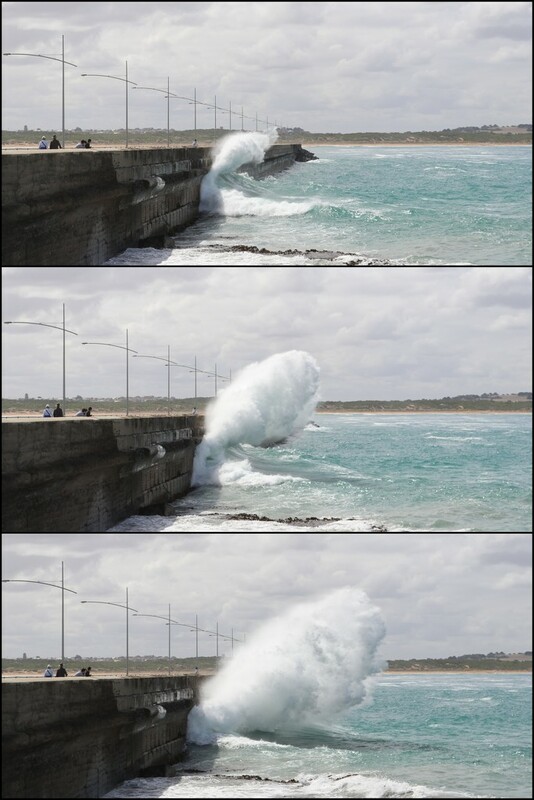 Very nice triptych to catch the action of the wave crashing! A wonderful set of images. Well captured. Great triptych, looks like autumn has arrived. Beautiful tripych of the bracking wave. Impressive! Great to show it in a collage like this. Wow... great series of images! Great sequence Denise, you nailed it.